STILLASTUD5769 has no current links. I don't know anything different. Other than being born in Alaska, and living there for about a year (my dad was stationed there in the Army), I know of no other place. 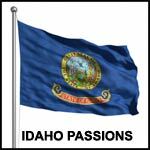 I was raised in small town Rigby and have lived in the Idaho Falls area for about 14 years. I don't necessarily fit in all of the time, as I'm not a Mormon and am a Democrat, but when I do leave the state, to travel, etc., I know it is my home.